WBZ-TV&apos;s Charlie Austin in 1995. Years ago, when Ronald Reagan was still president, and I still had black hair, I showed up at a press conference at the attorney general’s office near the State House. As I was about to enter the room where all the cameras were lined up, some guy barred me at the door. I looked over his shoulder. Reporters were milling around. No one was at the podium. “But it hasn’t even started,” I told the guy. 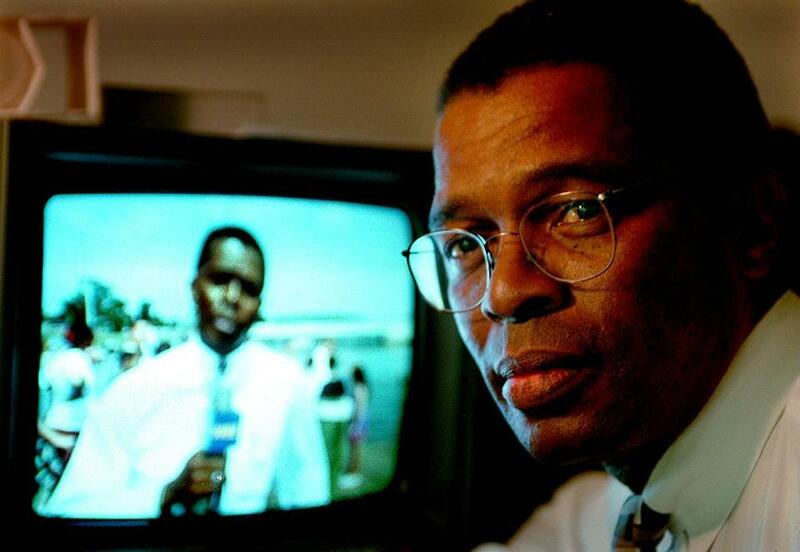 Mr. Austin, a widely respected journalist who broke new ground when he became one of the first African-American television reporters in Boston, has died. He shook his head. Folded his arms. Now, I was born at night but I wasn’t born in the dark. I knew what was going on. A few days earlier, I had written a story about some screw-up at the AG’s office. It wasn’t even that big of a deal. The story ran inside the paper. But some flunky in the AG’s office decided to do to me what Seamus the Irish Setter used to do to the roof of Mitt Romney’s car. Across the room, I saw Charlie Austin watching the whole thing. Charlie worked for Channel 4, and I knew him pretty well from the street. He was a good guy. A real reporter. So Charlie comes across the room and confronts the jerk from the AG’s office and asks what the problem is. The jerk from the AG’s office starts fumbling some lame excuse about me being too late to get in and Charlie starts remonstrating. The jerk from the AG’s office said something about me always being late and screwing stuff up and asking stupid questions. Those, apparently, were the magic words. Because the jerk from the AG’s office just stepped aside and I walked in, high-fiving Charlie as I passed and Charlie continued to give the jerk from the AG’s office the evil eye. We in this business have big egos. Huge egos. If they didn’t give us bylines, I’d probably be selling insurance. When I was younger, especially, when I showed up to a media scrum, whether it was a crime scene, or a courthouse, or a three-bagger at some three-decker, I’d survey the crowd, trying to see who might beat me on the story. In the ultra-competitive world of journalism, Charlie made everybody slow down a bit and just appreciate what was going on, appreciate the camaraderie. Whenever I bumped into Charlie, it was a good day. How many people in this world can you say that about? He was a great reporter, but he was a better man. Charlie was a trailblazer, for sure. With Sarah Ann Shaw, a true lady, and Walt Sanders, a true gentleman, Charlie was among the first black faces on Boston TV news. He started out as a film processor at WBZ a half century ago, the week that Martin Luther King Jr. was assassinated and the week that James Brown played a concert at Boston Garden credited with keeping the city calm. Charlie had a pretty cool Afro. One day, we were standing on Columbia Road, at a homicide scene. Charlie handed me one of the two coffees he got at Doughboy Donuts in Eddie Everett Square and I stared up at him. Charlie sipped at the coffee cautiously, because it was piping hot, then looked at me. “I think you should grow it out more,” I said. Just then, a Boston police detective named William “Bo” Mullane was walking by, on the way into the house where the body was. Bo stopped, looked me up and down, and shook his head. “We don’t have enough jail cells for people like him,” Bo Mullane said, walking away, betraying not so much as a smile. Charlie was a real softie. Especially with kids. Especially with sick kids and kids with special needs. His daughter Danielle was born with Down syndrome, and I think Charlie looked at every kid and saw Danielle, and so he loved all kids equally. Covering the famines in Africa in the 1980s had a real impact on Charlie. As an African-American, to see such suffering in the land of his forbears had a profound effect. Charlie was always spiritual. Seeing what he saw in Africa made him even more spiritual. Liz Walker always said she became a minister because Charlie kind of nudged her back into the church. Years ago, I went to see “Black Nativity” and was surprised to see Charlie walk on stage and start singing in that deep, “Swing Lo, Sweet Chariot” baritone of his. I shouldn’t have been surprised. Charlie had a fine singing voice. He probably could have made a living on stage. Charlie was one of those guys who could have done anything if he set his mind to it. Charlie’s faith was a lot deeper than mine, because one of the things that I’ve always struggled with is, if God is so good, why do so many bad things happen to good people? Charlie’s health was an example. He was sick for a long time. Too many bad ailments for a good man. On Tuesday morning, I was sitting on my couch, checking e-mails, watching “CBS This Morning,” when Kate Merrill came on the screen and said Charlie had died. It felt like a punch in the gut. It’s not like I was even that close to Charlie. I hadn’t seen him in years. We weren’t pen pals. But there was something so decent about Charlie, so pure, that I sat there on my couch and wept. We might not have deserved him, but he certainly deserved more than 73 years. Still, he did a lot in those 73 years, more than most. And, for us in this highly-competitive, ego-driven business, he set a high bar and a marvelous standard: you don’t have to be a jerk to be good. In fact, if you’re a jerk, you’ll never be as good as you should be. Rest easy, Charlie. And we’re not done, you and me. When I get to those pearly gates, I’m gonna need you to come out like you did at the AG’s office, and make some noise so they’ll let me in. Seriously, brother. I still need you to have my back, like you always did.